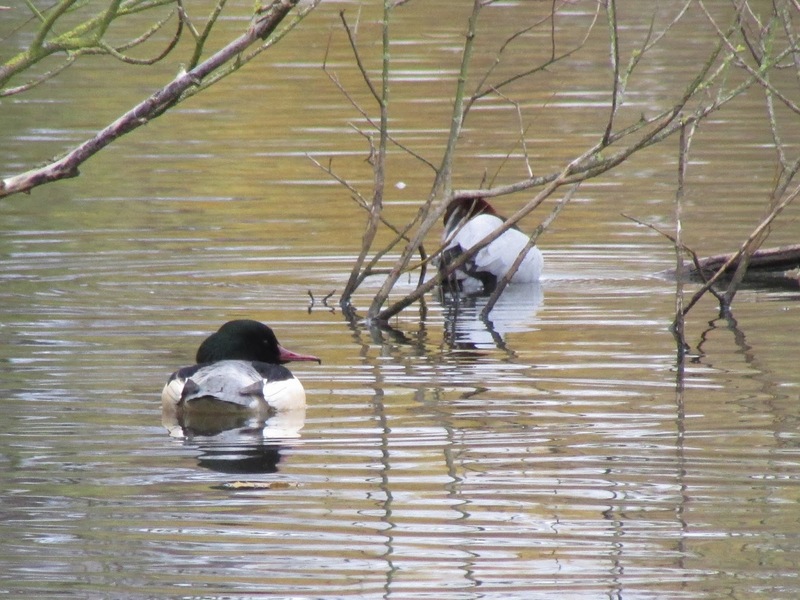 A small group of Goosanders, Mergus merganser, are regular wintering birds in East Park. Not your typical urban bird, you might say, but they can be found in some parks with large lakes during winter, where they may occasionally come for bread (!) (see some great images here). They are stunning ducks indeed, males have black, glossy green heads, with thick, streaked plumage at the back of the head forming a 'bun', and white underside, with a tinge of pink/orange. The tinge in their plumage is caused by carotenoids pigments likely obtained from their diet. 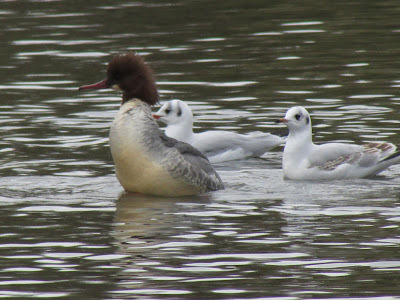 Females are grey, with creamy bellies and brown heads with a large fluffy crest at the back. The bill is long and thin, red with a dark hook. They are slim birds and float low on the water, and despite their long necks, they often keep them folded, giving the impression of having large heads. Yesterday, we visited the park and initially thought the birds were gone, possibly disturbed by some rowers training in the lake. Finally, we found a pair at the far end of the lake. 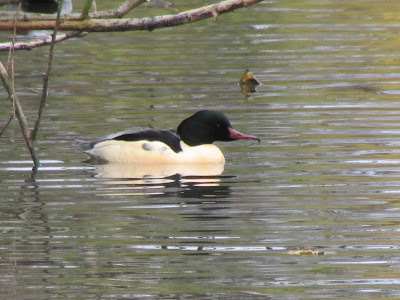 The male was initially loafing in the shelter of low hanging willow branches near a male Pochard, but then joined the female and started foraging. Despite the urban habitat, they are shy birds, that take shelter near the islands in the lake, and tend to move away from people. Goosanders belong to a group called 'sawbills' due to the serrated edge of their bills that help them grip slippery prey, a good feature for a fishing duck. They eat fish, amphibians and aquatic invertebrates, including crustaceans, snails and worms. 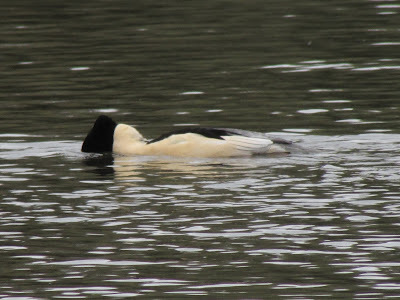 They rely on transparent water to fish, as they do it by sight, 'snorkelling' like grebes and cormorants do, with their forehead under water before diving propelling themselves only with their large webbed feet. They often probe with their bills on the bottom, to disturb hidden prey. 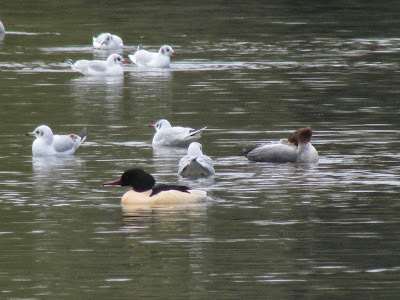 They are also known to engage in communal fishing, where cordons of Goosander will corral fish towards the shallows and dive at unison to catch them. This species underwent an expansion during the last century from their Scandinavian range. They only started breeding in the UK at the end of the 19th century and in England since 1941. 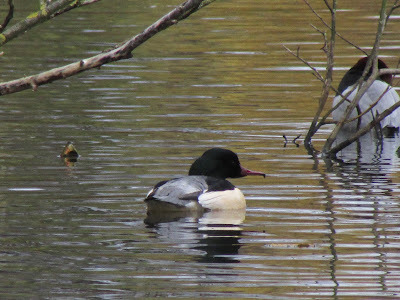 Now, they breed in upland rivers of Scotland, Wales and Northern England and winter more widely, with the wintering numbers boosted by birds also immigrating from the continent. In the early 1990's, coinciding with population growth in the UK, they started to winter in East Park, often in single figure numbers, with a maximum of about 30. Icy conditions might push them to last remaining open water in lakes, estuaries and sheltered sea shores, although they prefer freshwater. 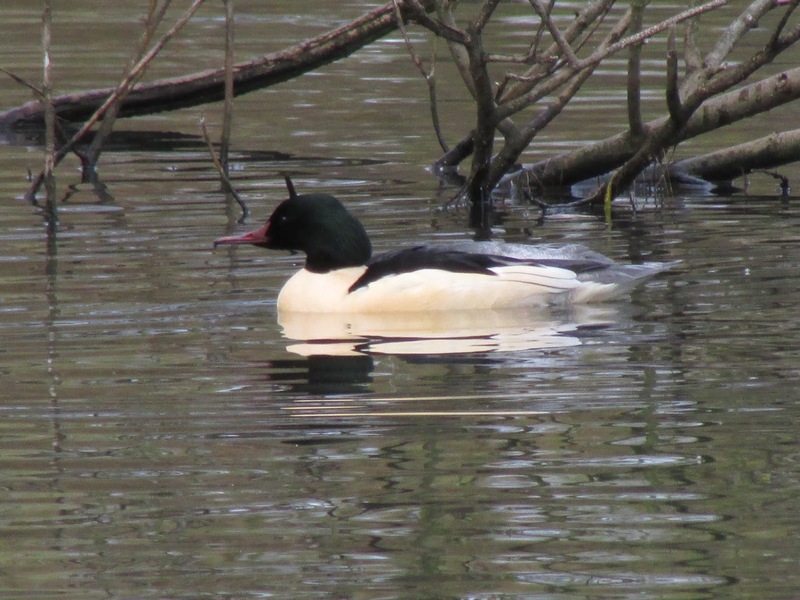 Goosanders - in a way similarly to other ducks - are unusual for birds, as males and females have different migration patterns. 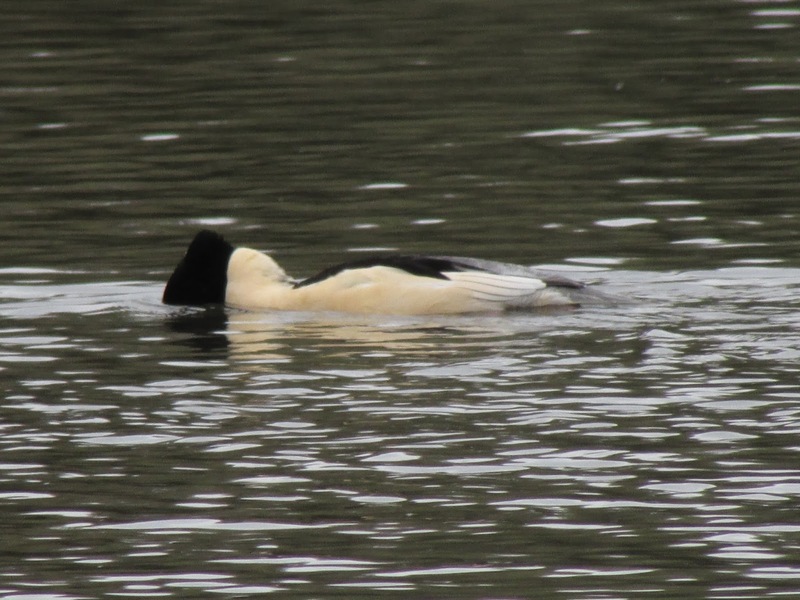 Most of the Western European drakes, including the British population, migrates to two fjords in northern Norway to moult their flight feathers between June and September, and then return to their wintering grounds in the UK. 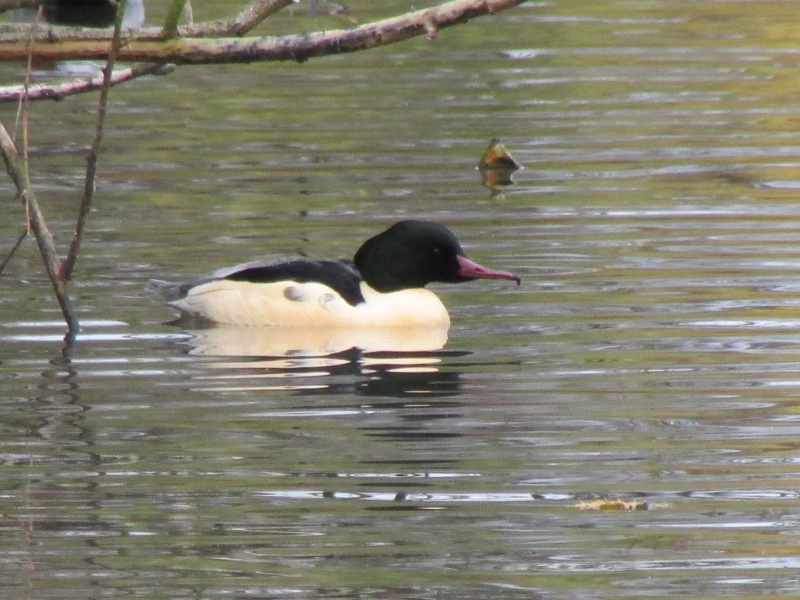 This male fidelity to their northern moulting grounds might be a cost of the expansion of the Goosander into southern Europe. Females, in contrast, moult later and more locally, late breeding females might moult on their local rivers before their offspring fledges, others congregate in local estuaries with an abundance of fish prey and presence of safe resting areas such as sandbars. It is not known how young birds find the moulting grounds, but association of young birds with more experienced ones in post-breeding roosting sites is a possibility. Pair formation takes place in the wintering grounds, from November-December, in their communal courtship. 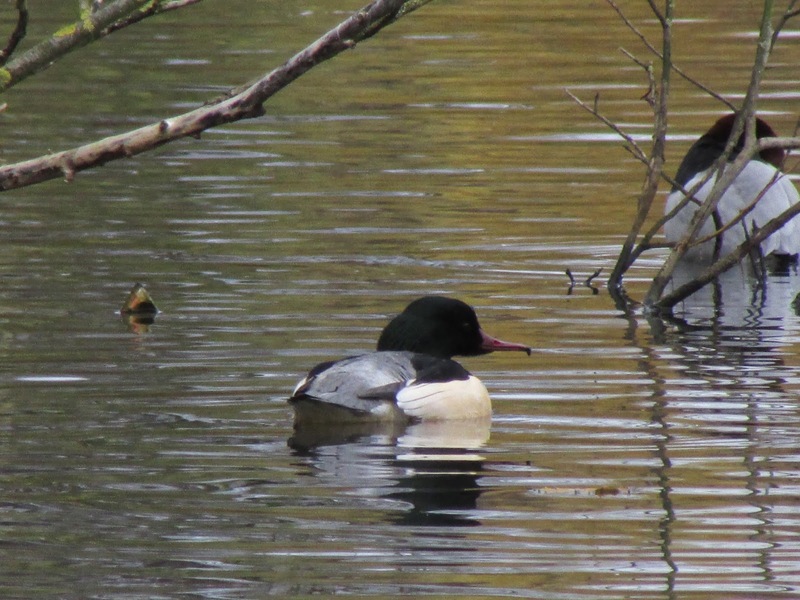 Male Goosander 'snorkelling' and showing its 'bun'. Female about to flap her wings, showing her creamy belly and shaggy 'hair style'. Hatton, P. L., and Marquiss, M. (2004). 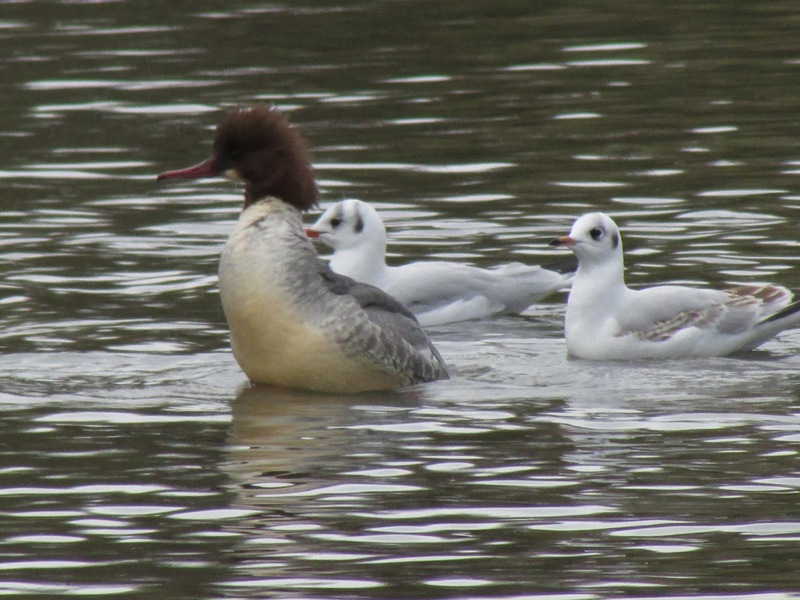 The origins of moulting Goosanders on the Eden Estuary. Ringing & Migration, 22, 70-74. Little, B., and Furness, R. W. (1985). Long‐distance moult migration by British Goosanders Mergus merganser. Ringing and Migration, 6, 77-82.